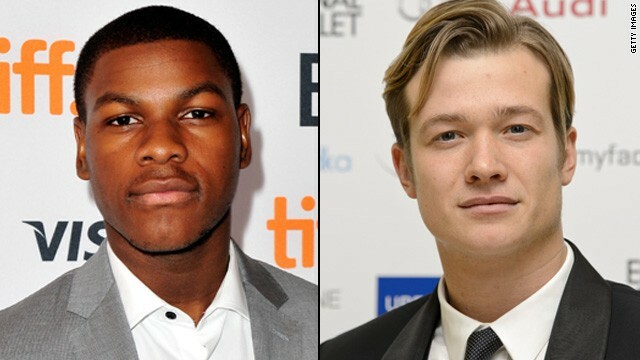 "Attack the Block's" John Boyega (left) and "Downton Abbey's" Ed Speleers are rumored to be in the running for "Star Wars: Episode VII's" lead role. Could one of these faces be the future lead of J.J. Abrams' "Star Wars: Episode VII"? According to Variety, the casting process is underway to find the right fit for the lead role, which is believed to be a Jedi apprentice. Some of the names floating around are screen actors Ed Speleers (Jimmy Kent from "Downton Abbey"), John Boyega ("Attack the Block") and Jesse Plemons ("Breaking Bad," "Friday Night Lights"), plus theater stars Matthew James Thomas and Ray Fisher. Studio Disney had no comment on the report, but inside sources have hinted to Variety that, while the search for the perfect lead is ongoing, those are five names that have been bumped to the top of the heap. J.J. Abrams has kept his "Star Wars: Episode VII" cards very close to the vest, declining to offer much in the way of character descriptions and plot. We do know that in October, Abrams and "Raiders of the Lost Ark" writer Lawrence Kasdan took over writing duties from the assigned screenwriter, Michael Arndt. It's unclear whether the new "Star Wars" trilogy will focus on the kids of Han Solo and Princess Leia, or if those characters will be supporting players, but it is expected that prior "Star Wars" stars like Harrison Ford and Mark Hamill will play some sort of role in the project. We also know that "Girls" star Adam Driver has been cast as the movie's villain. "Star Wars: Episode VII" is expected to begin filming this spring as it heads toward a release date of December 18, 2015. Looks like a red head in keeping with Luke and Mara's (red head) son Ben. While many say that the amazing and cohesive EU novels are not necessarily going to be embraced by the films, the fact is that they have an amazing body of cohesive work that would be de-valued if canon were re-written. Even in this story, there is mention of the Solo's kids, which is EU canon. Why devalue valued assets needlessly. It's great stuff, the Solo's kids, Mara, etc. No need for them to ruin the value of those assets. Looks like Ben to me.